Coverage: Live text and radio commentary of all three days, plus BBC TV highlights of qualifying and the race. Full details here. I'm aware that if things go my way I can win the World Championship at the US Grand Prix this weekend, but it is honestly not something I have thought about at all as we prepare for Sunday's race in Austin, Texas. It is not something I plan to spend any time contemplating, either. I have no idea what the permutations are that would make it happen and I won't look into them before the race. My mentality is that there are four races to go this season and as long as I have won it by the time the last race is finished, I really don't mind where it happens. It's great that I'm close to it. But I am not building it up in any way and I am not in a rush to get it done. It would be absolutely the wrong thing to do to say, 'I have to do it this weekend' and put myself under any extra stress. I have experienced this situation three times in the past. In 2007, I was super-tense in the last two races when I didn't need to be, and it messed me up and I lost the world championship. Last year, although I drove really well at the final race in Abu Dhabi, I felt a horrible pressure. As the days counted down towards the race, it got more and more nerve-wracking. Hopefully, I won't have that this year - and I certainly don't feel it yet. I am in a much better mental place at the moment. Last year, although I felt I drove really well, I had quite a few problems during the season, had to make up large points gaps a few times, and so it felt like I was battling for my life in the last race. This year has gone more smoothly and as a result I am in a position to potentially win it earlier. Of course, I'm not oblivious to the fact I am close to it. But the goal is to do what I have been doing every other weekend. Right now, for me it's all about consistency - of approach and of performance. If I happen to win the race and the other results go my way and it happens, that's a real blessing. If not, if I have a problem of some kind - which is possible; we have had some reliability issues in recent races - then I have three more races after that to focus on getting it done. I am relaxed, focused and super-driven to succeed. There are four races to go and I want to win them all - I am not here to let the other dudes win. That's all that's in my mind. The same thing goes for the fact that we are in America. Yes, I love it over here, Austin is a great city and I really enjoy the Circuit of the Americas as a track. But it has no significant impact on me as far as the racing goes, or in terms of how good it would feel to win. Before coming to Austin, I decided to have a weekend off with some close friends in Miami. In the week after the last race in Russia, I began to feel that I was getting really tired. I had been really going at it with work, both on track and off. Then we had Russia, after which we flew straight back to the factory to celebrate winning the constructors' championship with my Mercedes team and I had a couple of other engagements on the days after that. I suddenly really felt that I needed to go away somewhere warm for the weekend and relax and chill, or else I was going to get burnt out. So I rented a place in Miami, my friends came with me, I took the dogs and I didn't do any work for a few days. We spent time having fun and I did a lot of music, including playing the piano. I have always wanted to learn the piano, but because I travel so much I can never get any consistency of lessons. So everywhere I go, if I can find a piano, even if it is in the lobby of a hotel or something, I go on YouTube and pick some songs to learn. Sometimes I just do it by ear and it is really coming together. At the moment, I can play three songs pretty much - Someone Like You by Adele, Easy (Like Sunday Morning) by the Commodores and When I Was Your Man by Bruno Mars. I'm trying to get those off really well before I focus on some others. And I'm thinking maybe over the winter I might try to get some lessons sorted. I actually have a friend who is amazing - Mark Pellizzer from the band Magic. We write songs together, and if I can lock him down maybe he could teach me. As you probably know, I spend a lot of time over this side of the Atlantic. It's not just the USA either - I'm spending part of this winter in the mountains of British Colombia in Canada, where I also love it. I feel very much British, though. And I do love that the girls over here love the British accent! I have a lot of friends here and one of the things I like most about it is that most people don't know anything about Formula 1. I went through a period where I wasn't really making any new friends because it's difficult to know who is really going to be your friend, and who is just excited to be your friend because of what you are a part of. I began to notice that in Europe a lot. But I come here and I could be anyone. And I think because of that I have met some of my best new friends over here. They had no clue what I did. They'll ask what my job is, and I'll say I race cars. They're like: "Oh cool." But that's it. And it's like everything they do is better. My best friends are still the guys I grew up with. We holiday together throughout the year - we always spend our summer together, we're spending new year together this year and so on. But it's nice to be able to get to know new people for real without all the usual baggage. 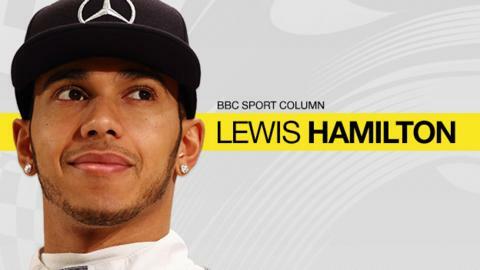 You can follow Hamilton on Twitter,Facebook and you can see exclusive content on his website.